I get asked this question a fair bit via email and often send long replies about my own personal experience in this area. I have been meaning to prepare a post about it for some time as it is an issue that affects many, including myself and to use that old cliche…if I can do it, anyone can. Although I have been cooking grain free for my husband for many years I have often personally wavered in and out of grain-free eating. I have always struggled with very strong sugar and refined grain/bad fat cravings (ie: fast/junk food). Pregnancy and motherhood pushed me over the edge. I have often been very frustrated with myself as I really do know better. So, here is me. 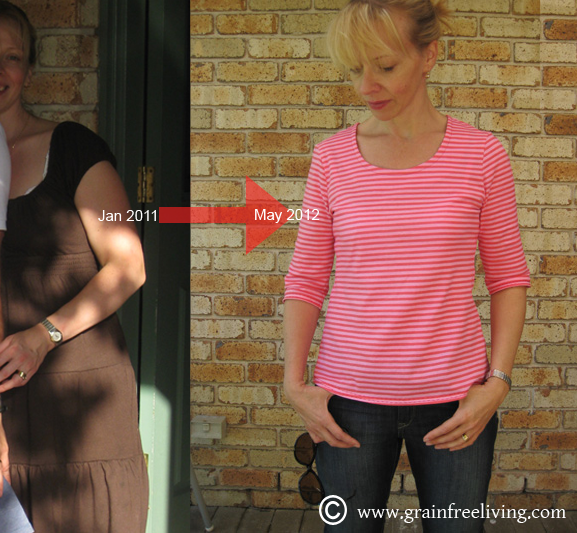 In the picture on the left (Bad photo I had to crop to cut out the innocent…this is AFTER I had already lost about 22 lbs / 10 kg of baby weight), this is what happens to me when I am eating grains. I get very quickly out of control. It’s not pretty. I feel bloated and exhausted. My blood sugar goes crazy. I get depressed. On the right, this is me after only 4 months “back on track”, after removing the grains and refined sugar out of my diet (cough, again). I am back in control, no longer suffering from depression or hormone-related mood swings. I have more energy, think clearer and generally just power through my day. Mental clarity is something I really notice in particular. I didn’t go on a “diet”. I didn’t calorie count or track my macronutrient ratios. I ate oil and high-fat ingredients. I was eating as much as I wanted, whenever I wanted. I was doing a 20-minute walk most days, not spending hours at the gym. Two things only…I stopped eating grains. This immediately for me eliminated all the junk food, hamburgers, doughnuts, cakes and other naughties. As I had out of control sugar cravings, I decided to go cold turkey and I stopped eating sugar. I knew that sugar and grains were my crack cocaine and I had to avoid them completely. 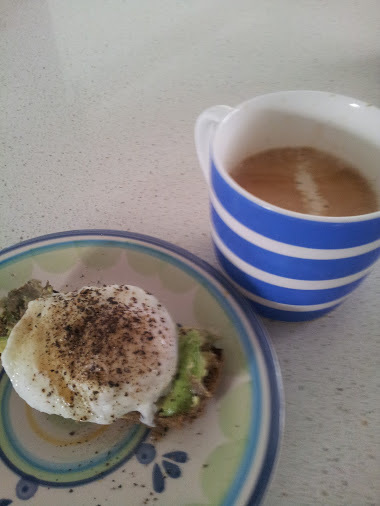 I swapped jam on toast for…Paleo bread, toasted and topped with avocado, a free range poached egg from our chickens, lashings of pepper and a black coffee from our freshly roasted beans. And I’m happy. This will last me for hours. 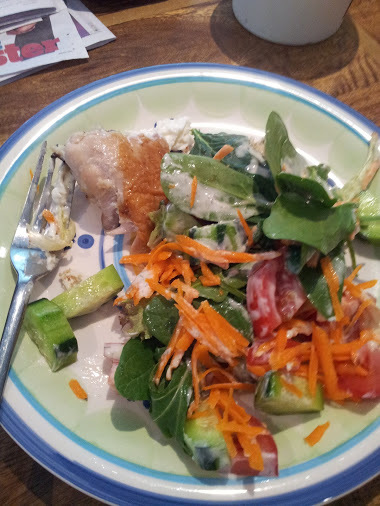 I swapped absolute total rubbish (hamburger, creamy pasta, instant noodles or some other “why do they even call this food” grain-based food) for… I am usually in a hurry, juggling children or otherwise rushed. I usually grab either leftover meat from the fridge or a small tin of tuna. I add a chopped cucumber and a chopped carrot. I throw on some good oil like olive oil and lemon juice. It takes about 30 seconds to prepare and fills me up. If I am more organised or have more time, I will make a big salad and grill some chicken or lamb to throw on top. I swapped cakes, cookies or some other sweet treat and milky coffee for… an opportunity to take some sorely needed supplements in a tasty, satisfying package. As I am ok with fermented dairy, I take some organic natural (no additives or sweeteners) yoghurt (I try to make my own from raw goats milk but failing that I use the best organic sheep’s milk brand I can find), about 2 spoons or 100g. I throw in my daily probiotic (I take to help keep my sugar cravings under control by keeping my gut flora healthy – for me, there is a connection) and 2 tablespoons of Udo’s Oil (brain food, helps with my overall mental wellbeing – its a big dose of balanced Omega 3-6-9). 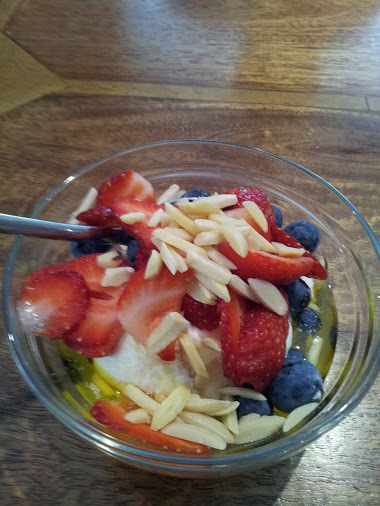 I add in a handful of berries and a handful of nuts or sunflower seeds. It’s totally yum, feels like a decadent treat and feeds my brain and my gut. I’ve recently added a spoon or two of fresh coconut meat puree since I learnt how to crack open a coconut. 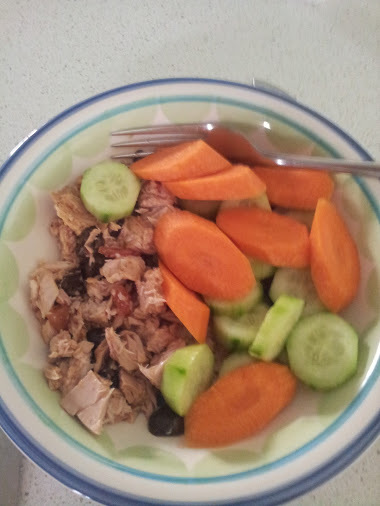 I replaced my usual grain-based carbohydrate (of rice, pasta or bread) for… more vegies. Dinner is varied with a wide range of casseroles, curries or roast or grilled meats flavoured with lots of different spices, a large selection of either salad or vegetables. Occasionally I add in a carbohydrate in the form of potato, sweet potato or quinoa, but much less than I used to eat. I eat an enormous amount of vegetable matter. I make it tasty by always using a great dressing – Tahini, Lemon and Dill is a favourite. If I feel like more I grab some blueberries or another berry in season and a few nuts like brazil nuts, almonds or macadamia nuts. Generally, though, the above food keeps me very satisfied and I don’t often feel like eating more. I keep the fruit as a treat as I personally am better when I keep even fruit sugars to a minimum. I love a dried fig with a black coffee sometimes. I swapped milky coffee, milo (an Australian chocolate drink), soda and juice with… water, lots and lots of water. I don’t drink juice or alcohol, I personally find I am better without it. On the above eating plan, despite the large amounts of fat (about 60% of my calories come from fat) from coconut oil, avocado, olive oil and nuts and seeds, I generally lost 1kg or 2lbs a week, without “trying”. Now as my weight is closer to “ideal” (by ideal I mean what my body wants to be) I don’t lose that much each week but my weight is still slowly dropping. I still feel that I have possibly 5 – 7 lbs / 2 – 3 kgs to lose. I am just eating in a way that I intend to sustain forever, I am not restricting myself and I feel that I am eating in a way that is sustainable forever. Now I know I said I didn’t calorie count or follow any specific macronutrient ratios (protein/fat/carb breakdown) but I did get curious to see what my body was naturally demanding and decided to track them for a week to see what I was actually doing. I am generally averaging about 1400 calories a day, which is low and not surprising that I lost weight purely from a calorie viewpoint. I am not feeling hungry on this amount as I get so many of these calories from fat, which makes me feel full, and quantity wise I am eating so many vegetables that also keep me full and satisfied. My macronutrient ratios average around 60% fat, 20% protein, 20% carbs. Although I am not trying to be low carb, I have found that by not eating grains or sugar, and limiting my fruit to the low fructose choices, I am eating under 100g of carbs a day, usually around the 70g mark, which interestingly is what Mark Sisson refers to as the “weight loss sweet spot”. This is despite eating unlimited vegetables and occasionally eating quinoa and starchy carbs like potato. I found this really interesting as this all fell into place without any effort on my part just by stopping grains and sugars. Marks Daily Apple. The Primal Diet is basically how I eat now. I spend a fair bit of time reading Mark’s articles. The Sucess Story section is also very inspirational, especially this one. Sarah Wilson’s I Quit Sugar Program really helped me with my sugar addiction. Learning about body typing/somatypes also helped me understand why some body types need to be lower carb than others. I will post some more about this area soon because it is really interesting. The Candida Diet website helped me understand more about my sugar addiction, the Candida that was driving it and helped me realise how important probiotics and antifungals were for me personally. Well, that is my story, and explains why I have been missing in action since the birth of my second daughter in 2010 (let me tell you, pelvic organ prolapse is no picnic). Giving up grains and sugar (to me they are now closely linked in terms of the damage they do) helped me recover on many levels and I hope my story can help others.